The longer Florence sticks around, the more economic damage it is going to do. The new trajectory means the storm will idle at sea for longer, creating even heavier and prolonged rains and storm surges for the Carolinas and possibly northern parts of Georgia. Forecasters say those areas could be battered with hurricane conditions for at least 24 hours. Let me try to put this into perspective for you. Try to think of something extremely painful that has happened to you. Would you rather experience that for a minute or for an hour? You see, it isn’t just the intensity of the storm that matters. The duration is a major factor too, and what we could be facing from Hurricane Florence could be without precedent. Could you imagine getting nearly four feet of rain where you live? As that rain is coming down, the wind is going to be whipping at a speed of about 100 miles an hour, and let us not forget that the storm surge kills more people than anything else during a hurricane. “This is going to be a Mike Tyson punch to the Carolina coast,” he warned. It just occurred to me that some of my readers may be so young that they don’t even know who Mike Tyson is. If you don’t know, trust me, just Google him. Analytics firm CoreLogic predicts that the damage from Florence could be more than $170 billion – making it the most expensive hurricane to hit the continental U.S.
Hurricanes Katrina and Harvey, which decimated parts of the Gulf states and Texas in 2005 and 2017 respectively, cost more than $125 billion. Hurricane Sandy, which hit the Mid-Atlantic and New England areas in 2012, came in at $65 billion, according to the National Hurricane Center. It is well over a decade later, and the economy of New Orleans has never fully recovered from Hurricane Katrina. Let us pray that the Carolinas escape a similar fate, but if this storm was going to miss us it would have turned by now. 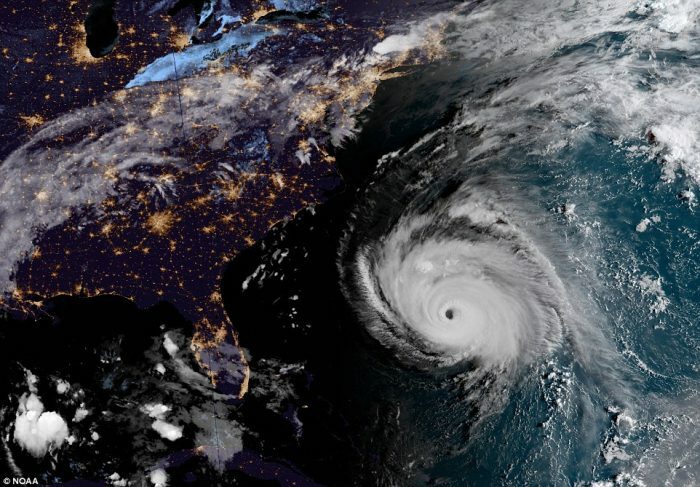 The National Weather Service described Florence as ‘the storm of a lifetime for portions of the Carolina coast’. It said the hurricane’s center would approach the coast of North Carolina or South Carolina on Thursday and Friday before moving slowly near the coastline through Saturday. The Federal Emergency Management Agency warned that Wednesday was the last day for people to safely evacuated before the hurricane hit. This is yet another example that shows that our planet is becoming increasingly unstable. At this moment, there are more than half a dozen major tropical storms brewing in the Atlantic and Pacific oceans combined, and that is not normal. Our world is in a rapid state of change, and it is going to be a rough ride ahead for all of us.